My next gowbed I will use Hydroton, so I need another rack. Decide to try out making my own with Slotted Angle Iron since Hydroton is much lighter than pebbles. 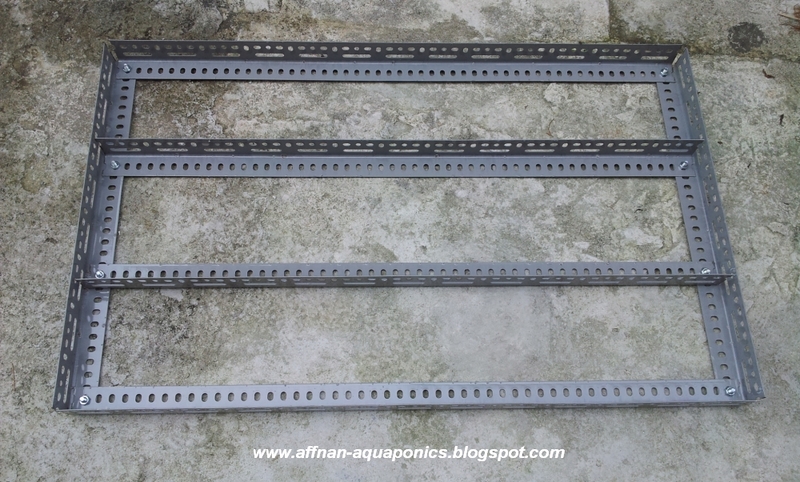 I'm making a 36" (W) x 24" (D) x 27" (H) rack what I need is 4 pieces of this Slotted Angle Iron that is 10 ft (120") in length. 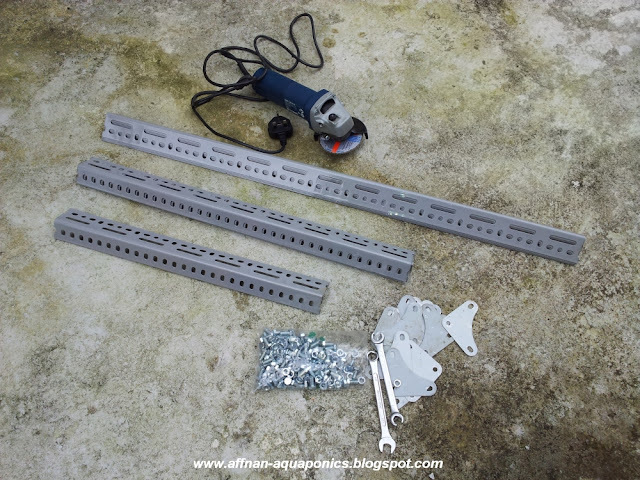 It cost me RM 16.00 each at the local hardware and to minimize cost I need to carefully planned the cutting. Each of this will be cut like this 36" x 2 and 24" x 2 which makes it 120" and 2 pieces will be cut the same way the 3rd piece I only need to cut another 2 of 36" , the last piece I cut 27" x 4 for the leg but I should have cut it 30" x 4 making 120" so no waste. Cutting tool - I use that Borsch Angle Grinder with cutting wheels. Cut this Angle Iron at multiple of 3" otherwise nut and screw holes won't align properly. 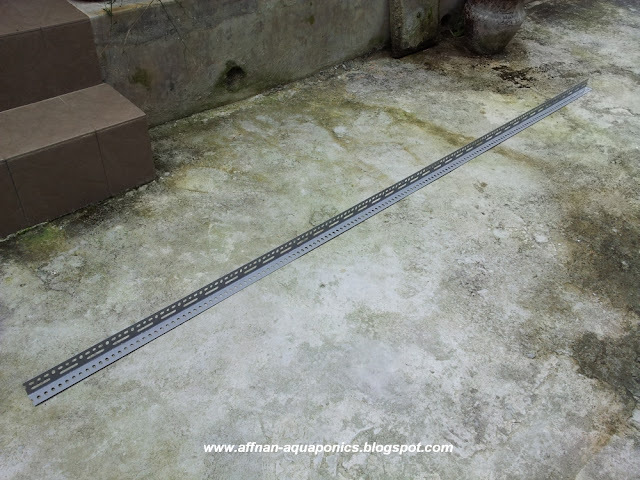 Photo below is where you must cut this type of angle iron to avoid problems. That part above is at every 3" , so if you are making anything using this angle iron, make sure its a multiple of 3" and cut it at this point. 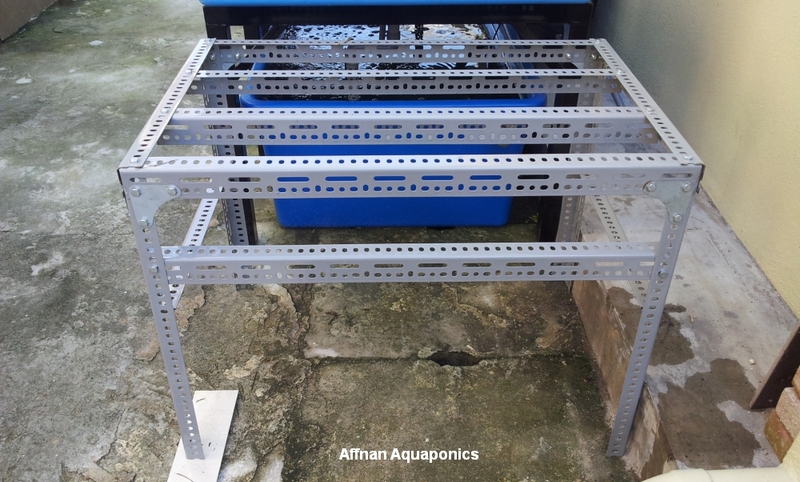 Above the rack top assembled, this photo the long length is 39" on final assembly I trim off another 3" making it 36" so that the growbed sit nicely on top, however it may have problem spanning the fish tank. 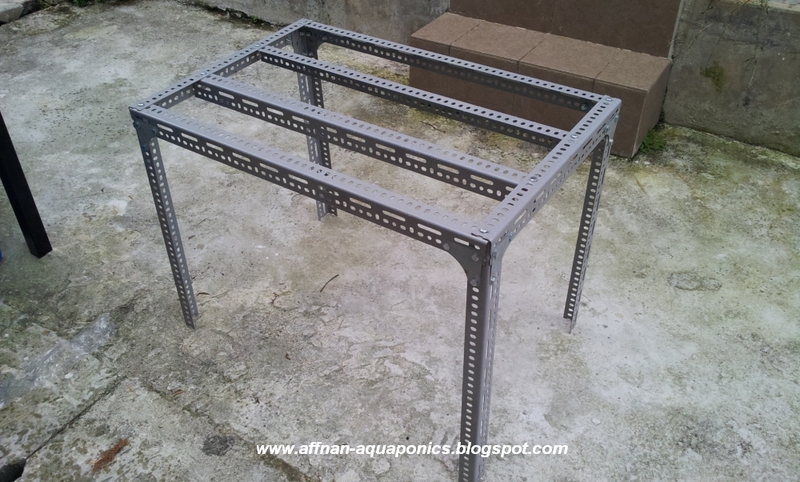 If you need to span the fish tank with this rack its best to make it 39" x 24" x 27" but with this you may need extra angle iron to do. Legs installed, but don't tighten any screw and nut yet just get it in and secure lightly, I need to make everything straight only then I'll tighten. 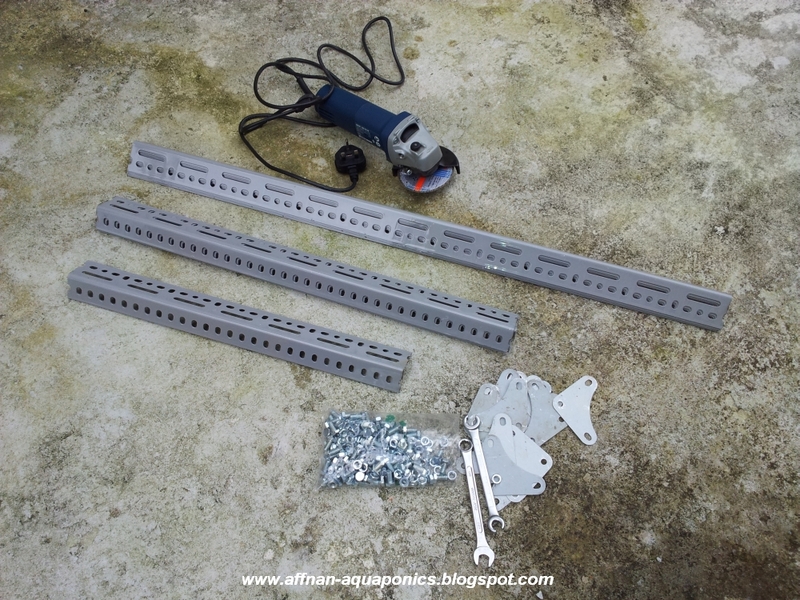 Two of that 36" and another two 24" piece make braces to add strength and rigidity. 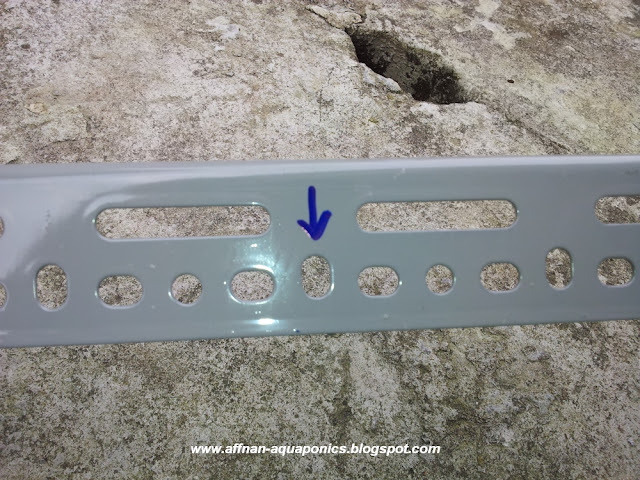 It may be a bit difficult to insert the screw due to holes not exactly align, however if you choose not to cut on the recommended location it then may be impossible to align. 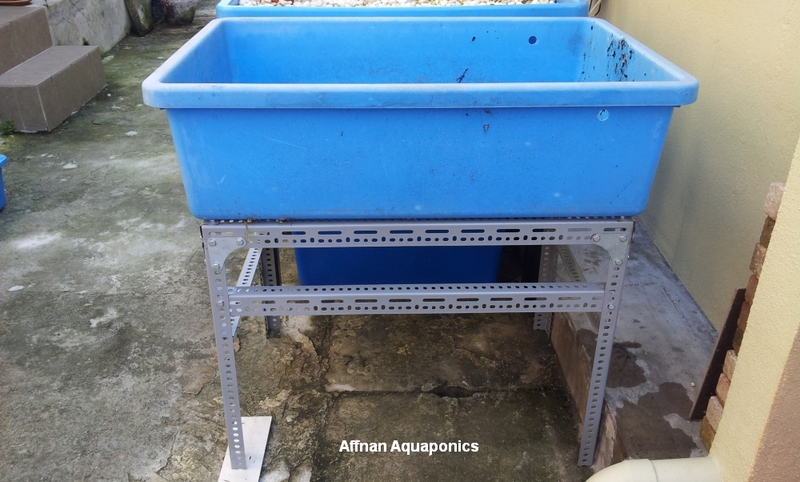 Not sure this will hold pebbles because a fully laden growbed is about 200 kg in weight, with water it should be more around 250 kg . Hydroton should be OK due to its light weight. 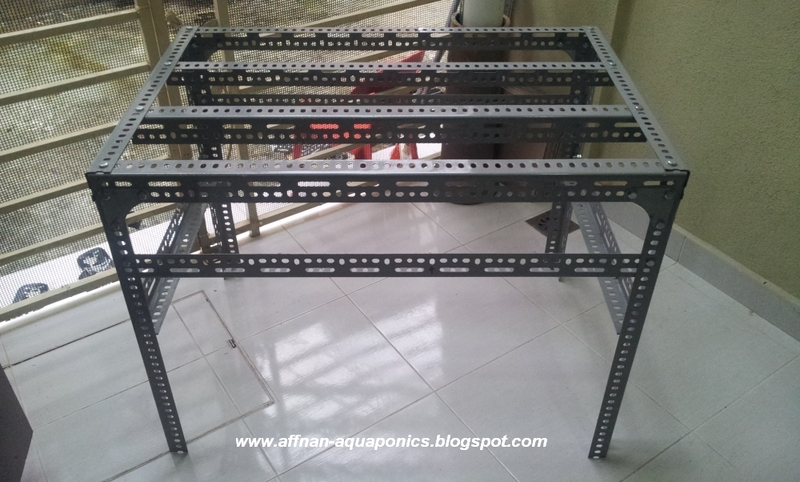 Total cost for this rack is RM 70.00 which exclude man hour which is at about 3 hours. very nice tutorial that was going on my mind. Also want to ask is it okay to use 24" x 16" x 12" Grow bed and also fish tank of same size or a little big ? Should be ok, with same size gb and tank setup should use 25% of water. Anything less than 30% is okay. Nice one Affnan. I have this in mind but have no idea what the material and cost will be like . This posting save me a trip to hardware shop asking about it. Thanks as always this blog is very informative. There are two type of angle iron here, this one is RM 16.00 and another RM 14.00 which has both side with that single row holes. Not suitable for heavy shelving.